My favorite ice cream growing up was mint chocolate chip but this mint ice cream is little more subtle in flavor but oh so delicious! Pair it with chocolate brownies or add dark chocolate chips or drizzle with chocolate sauce, you get the idea. I was inspired to make this from The Perfect Scoop and made my first batch last year for our Family Party. I added chopped up peppermint patties (another idea) and it was a very popular choice among my family members. Last year, I had both peppermint and spearmint plants to choose from for the mint. I looked up to see whether there was any culinary difference and really could not find anything substantial. People seemed to interchange them both in their cooking and baking. 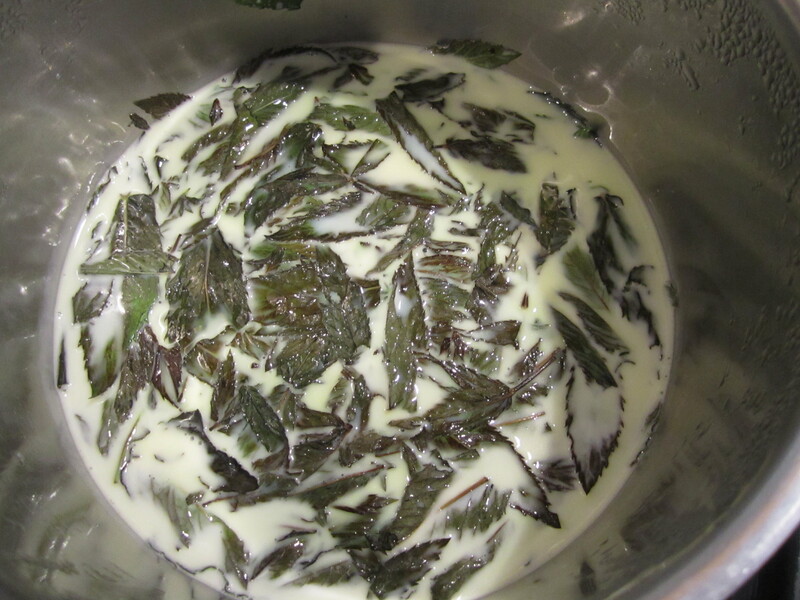 So I decided on the spearmint and after the leaves sat in the milk/cream mixture, the color was exactly as David Lebovitz had stated in his book: “a lovely shade of emerald”. Unfortunately, our mint plants did not survive the winter. When I was plant shopping with my husband this year, I knew I needed some mint and decided just to get the peppermint variety. 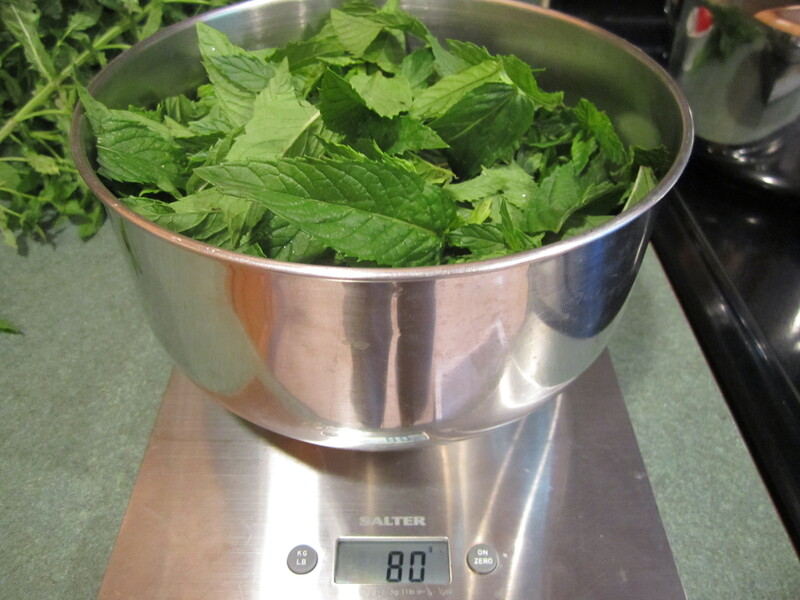 Earlier this week I was ready to make the mint ice cream for our second annual family party and picked the mint and proceeded with the recipe. After soaking the leaves in the milk/cream mixture and waiting the specified one hour, lo and behold there was no green color. Hmmmm. I proceeded with the ice cream and the taste was good but I was very disappointed about the color. It was just a white cream color. Two days later I woke up thinking or woke up thinking in my dream (really couldn’t tell) and said to myself, “Eureka, I know why there was no green color: I should cut up the leaves!”. So that’s what I did and after the soaking, I looked and there was still no green color. Oh boy. Did I imagine the green color? No, he said it right in his book “a lovely shade of emerald”. What was going on here? So after giving it some thought during the day, I was almost positive the spearmint was the answer. Today, my husband and I decided to go bike riding up in the Amenia, New York area and I explained to him on the hour long car ride my thoughts about the mint. 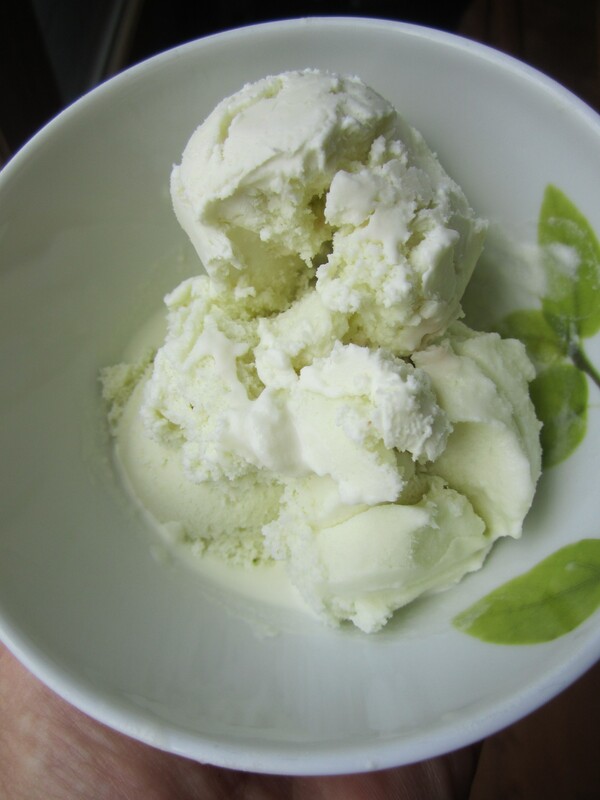 He said to me, “Really this is just theory and you haven’t really proven that the spearmint makes the ice cream green. You really need to make it again with the spearmint.” How many husbands would actually discuss with you your theories on cooking and baking? I have one in a million, thanks honey! 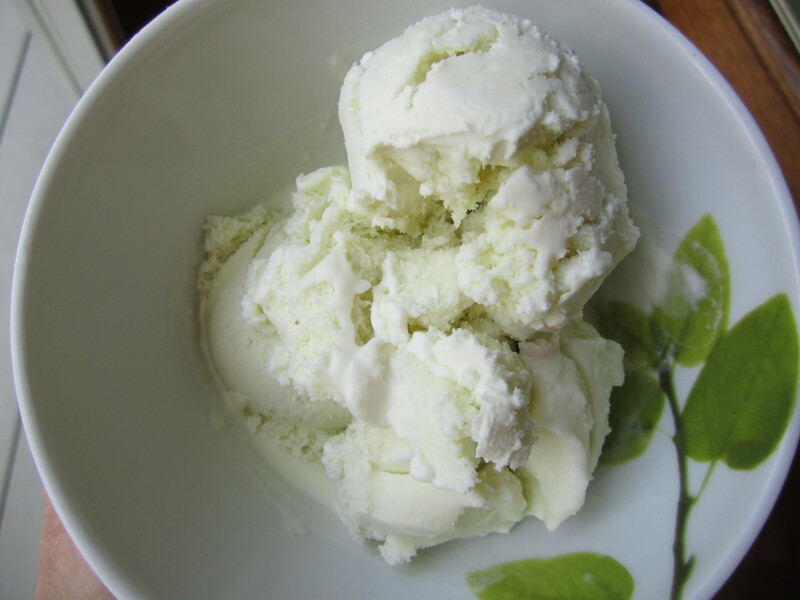 So he said that he would search for some spearmint plants in his travels and if we planted them soon, they would be ready by the fall so I could make the ice cream again. But really I wanted to make it now. When we were finished with our bike ride we decided to stop at McEnroe Organic Farm Market to see whether they had any spearmint plants. No luck. But they had a little Discovery Garden and of course being the horticulturist that we are, we decided to take the walk. Up the little hill and to the left we saw rows of herbs and took a peek and there was a large clump of spearmint! Wow, would they let us pick it? I was so excited!! So we went back down to the market stand and the woman said to ask Suco, the young woman who was up there. So we trotted back up the hill and asked (with our fingers crossed) “Would it be possible for us to pick some of your Spearmint?” and Suco delightedly said “Yes, of course!” and handed us two pruning shears. I could not believe our luck. 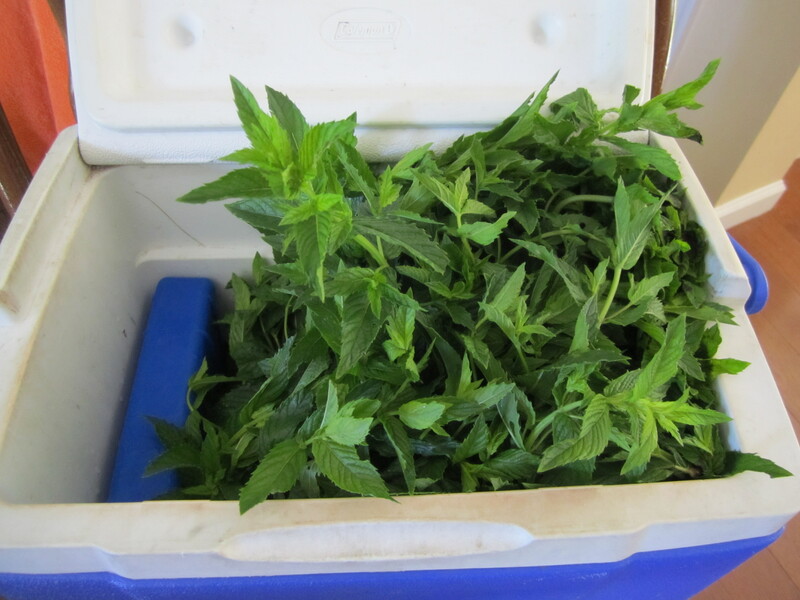 So we picked about 40 stems of really nice spearmint and went back to Suco to ask how much. My husband piped up and told her I was making mint ice cream and then I told her my dilemma about the peppermint and how I thought it might be the spearmint that made the ice cream green. And then of course I mentioned I would be writing about it on my food blog. Her eyes lit up and she took our picture holding the mint. As soon as we got home, I started on the first part of the mint ice cream. Soaking the leaves in the warm milk/cream. And to my delight, after the leaves had been immersed for one hour, the milk/cream mixture was a “lovely shade of emerald”!! Thank you Suco! If I had found plants, it would have probably taken me 2 months for them to get large enough for me to harvest. But thanks to you, I was able to prove my theory in 2 hours! 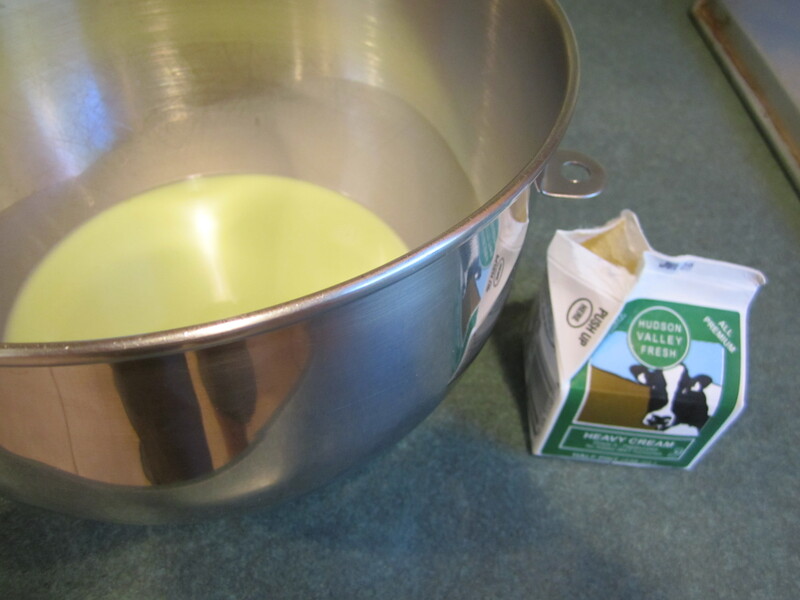 Place the milk, sugar, 1 cup of heavy cream and salt in a medium saucepan over medium heat. Stir for 1 minute to dissolve the sugar. 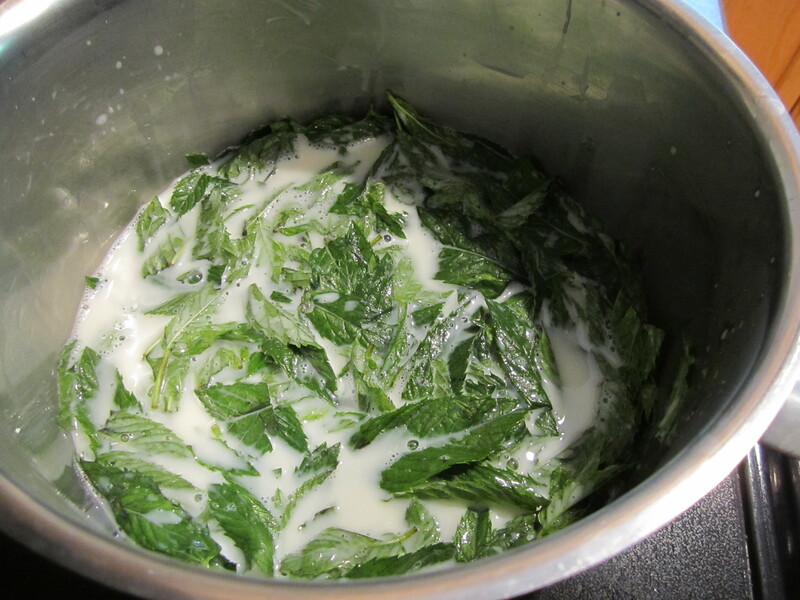 Add the spearmint leaves and stir with a heat proof rubber spatula until the leaves are immersed in the milk/cream mixture and the leaves wilt, about 2 or 3 minutes. Remove from the heat, cover and let sit for one hour at room temperature. 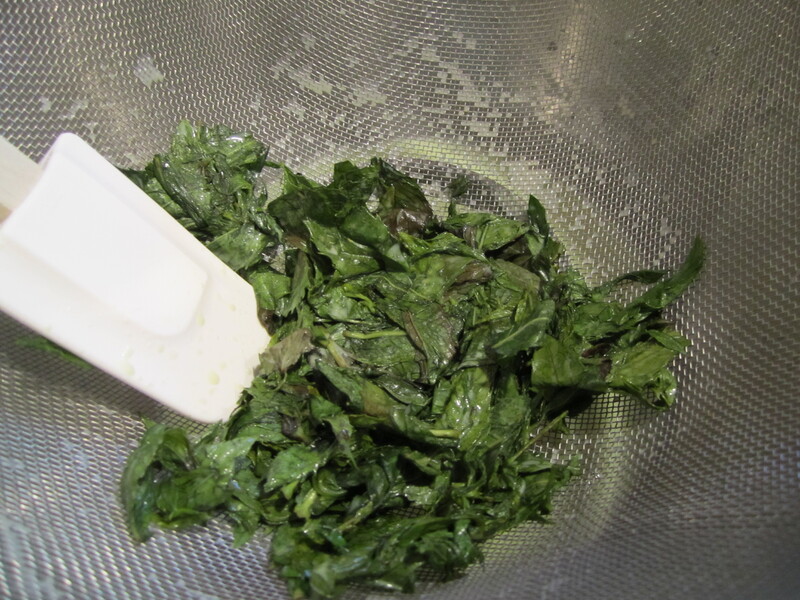 Using a medium strainer, strain the spearmint infused milk/cream mixture into a medium bowl, pressing down on the leaves to get as much mint flavor as possible. 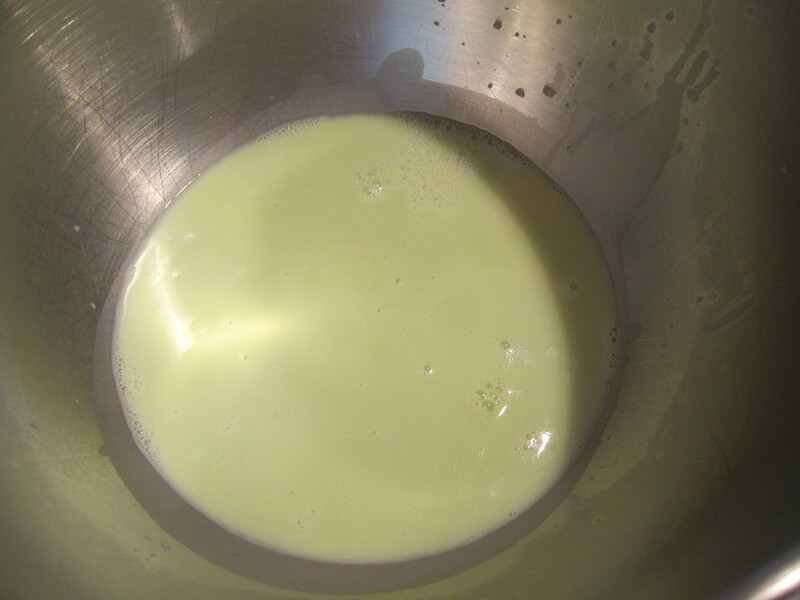 The milk/cream mixture “will be a lovely shade of emerald”. Discard the leaves. Add to the bowl, the remaining 1 cup of heavy cream and stir together. Cover with plastic wrap and set in the refrigerator for 3-4 hours until really cold.